Already in 2019, at least two journalists have allegedly been targeted for murder because of their work. Ahmed Hussein-Suale Divela was killed by two men in Ghana on Jan. 16; he had been investigating corruption in African soccer and politics. Rafael Murúa Manríquez’s body was found in northern Mexico with several wounds after a family member was told he had been abducted. A third reporter, freelancer Mohammed Ben Khalifa, was killed in Libya during a clash between two militia groups. The ways in which journalists find themselves and their work under threat vary from region to region, though there are commonalities. Assassinations grab headlines, such as the case of Ján Kuciak, a 27-year-old Slovak investigative journalist who was murdered in his own home along with his fiancée in February, and Jamal Khashoggi, the Virginia-based Washington Post columnist who was executed in the Saudi consulate in Turkey in October. And in June, Jarrod Ramos was indicted on 23 charges for his alleged role in the murder of four journalists and a sales associate at the Capital Gazette newspaper in Maryland; this last incident placed the U.S. among the ranks of the deadliest countries in the world for journalists last year, according to the nonprofit advocacy group Reporters Without Borders (RSF). 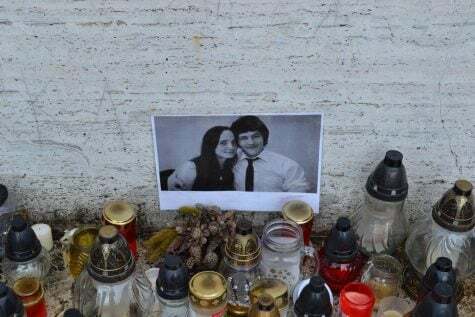 A memorial to journalist Ján Kuciak and his fiancée Martina Kušnírová in the southern Slovak town of Rimavská Sobota, taken March 12, 2018. The pair were murdered in February, in their home in southwestern Slovakia. Three suspects have been charged with murder. Imprisonment, torture, harassment and intimidation are also increasingly employed against journalists. In Myanmar, for example, two Reuters journalists were sentenced to seven years in Jail in September for violating the country’s Official Secrets Act while investigating the murders of Rohingya Muslims; a police witness testified at trial that the two were set up. And in Afghanistan, where a war between U.S.-backed government forces and Taliban insurgents has been waged for the last 17 years, 15 members of the media were killed, according to a year-end report by RSF. That made it the deadliest country in the world for journalists, though globally the number of journalists killed in conflict zones was at an 8-year low, according to the Committee to Protect Journalists, a New York-based nonprofit. Michael DeDora, a Washington Advocacy Manager with CPJ, said threats to journalists have changed over the years. While authoritarian regimes often get much of the blame for assaults on journalists, democracies aren’t immune either. Noni Ghani, a communications officer with RSF, said press freedoms in democratic countries have been declining. “The obsession with surveillance and the violations of the right to confidential sources have contributed to the continuing decline of countries which RSF previously regarded as safe-havens for press freedom,” she said. On the group’s “press freedom index,” the U.S. sits at no. 45, between Romania and Italy; Norway sits at no. 1 while North Korea is in last place. Some nonprofits believe the U.S. should strengthen its existing laws and protections for journalists. Melissa Wasser, a policy analyst for the Washington, D.C.-based Reporters Committee for Freedom of the Press, said two ways could be to implement a federal shield law and an anti-SLAPP law. While most U.S. states recognize the rights of reporters to shield themselves from divulging their confidential sources, there is no federal counterpart. And SLAPP, which stands for “strategic lawsuits against public participation,” are often used to silence critics by burdening them with costly lawsuits. “Passing a federal anti-SLAPP law would help solve the split of authority of whether state anti-SLAPP laws apply in federal court and create a federal standard for these cases,” she said. 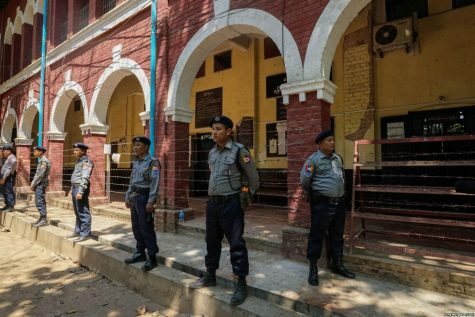 Myanmar police officers stand on guard outside a courtroom in Insein Township during Wa Lone and Kyaw Soe Oo’s trial April 11, 2018. So, is the world becoming less safe for journalists? The CPJ’s DeDora said it’s difficult to measure all the threats. “Certainly journalists around the world continue to face imprisonment at an alarming rate. In 2018, for the third year in a row, 251 or more journalists were jailed around the world … in addition, the total number of journalists killed in connection to their work rose to its highest level in three years,” he said. In its 2018 “worldwide roundup,” RSF said three journalists were missing, 80 were killed, 60 were held hostage and 348 were detained in 2018. Nine journalists were murdered in Mexico, the deadliest tally for a country not at war. The other deadliest countries were Afghanistan, Syria, Yemen, India and the United States. The majority of imprisoned journalists were being held in China, followed by Egypt, Turkey, Saudi Arabia and Iran. Going into 2019, the RSF’s Ghani said, nations around the world must accept the legitimacy of an independent press and pass meaningful legislation that defends journalists.